I arrived in Israel for the first time in February 1992, smack dab in the middle of one of the biggest blizzards in Israeli history. I remember setting out for a walk from the place I was staying, and looking out over the snow-frosted Judean Desert. I felt like I had entered the wardrobe and come out the other side to the living pages of the Bible. Otherworldly. Primordial. Awe-inspiring. A year later, right after my college graduation, I moved to Israel for good. And while it is human nature to eventually take ongoing blessings for granted (when was the last time you leapt for joy over a cup of clean water or a healthy child or a roof over your head?) for some strange reason I HAVE managed to maintain a constant awareness of the blessing of life in this gorgeous and holy and intensely alive country. I love Israelis. I love raising kids here. I love the way of life here. I love that every step I take here is a mitzvah. I love it, love it, love it! And among the many things I love about Israel, one of the things I love the most is the spectacular beauty of this Land. Drop me off anywhere in Israel, and within half an hour I can find a place that is jaw-droppingly gorgeous- the Mediterranean, the Golan, the craters of the Negev, the rolling deep green hills of the Galillee. It’s a land that is as perfect and exquisite as the inside of a geode. Yesterday, in honor of our 15th wedding anniversary, my husband and I took off the morning to go on a hike in order to bask in the beauty of the Land of Israel. 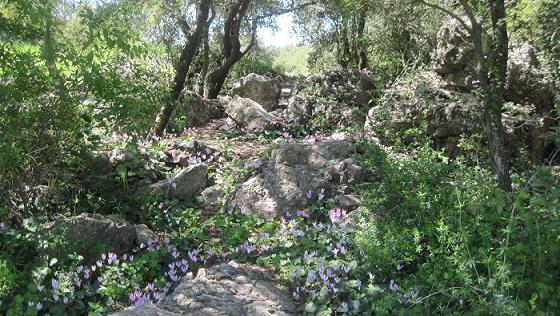 And at Churvat Saadim we discovered the largest, most breathtaking patch of cyclamen I have EVER seen. I would love Israel even if it wasn’t the most beautiful country on the planet. Just like I would love my baby if she wasn’t the most beautiful baby in the world. But I feel like this Land’s beauty is an extra kindness to us, the ribbon on the box of this great gift Hashem gave me and you and the entire Jewish people. ditto everything you said. We just moved from big city to moshhav (just outside the city) in the south, and WHAT A DIFFERECNE in energy and appreciation for the land of Israel. I remember that the only time I would feel this fulfilled was on the trips up north, but now every morning on the way to school we see the gorgeous patches of land and what the workers are picking today? we saw them clear a whole feild of cabbage both white and red, and the kids are so excited to see where the vegetables and fruits really come from, and the horses and cows and beautiful birds and sunsets…this is what Israel is all about- ongoing production of beauty and nourishment for the soul. i love it love it love it too. Tefila ajat: bezeman karov gam bishbilenu!!! LeShana Habaa biYerushalaim!!! Amen veAmen!!! really beautiful post! although I live in the US, I heartily agree about eretz yisroael! your photos of the cyclamen were great! you should know in the US, cyclamen is a “rare” indoor plant that is hard to grow and difficult to make blossom! beautiful view and Is worth to go there!